The Blake Blaster® is proud to introduce a revolutionary squat trainer and home gym solution in one! If you travel and have had issues finding a place to work out or you are super busy with work and life and don't feel like you have time to go to the gym, we have the solution for you! Hi, I'm Tom Blake, owner and inventor of The Blake Blaster. I created The Blake Blaster out of my own need for a portable workout solution and my passion for health and fitness. I believe that years of military service and currently being a commercial airline pilot has given me unique insight to some of the challenges that arise when people, including myself, travel. Finding a gym or finding time to go to a gym can be difficult. Not working out for me caused muscles in my legs to weaken and atrophy. For me, that was a burden that decreased my happiness and lifestyle. You may experience some of the same issues, or maybe you just want to tighten and tone or build a summer beach booty! I'm confident in telling you that my product will help you in any of those cases. To make your success with The Blake Blaster practically guaranteed, myself and my team put together an instructional DVD and exercise instruction sheet that features quite a few common exercises you can do with our patented wedge trainer. With this, there are only two things that can stop you. First being that you don't have the equipment yet! That's an easy one to solve with quick shipping by Amazon. The second thing is YOU! Just do yourself a favor and if you won't do it for you, find someone you care about and use them as motivation for building a better life with The Blake Blaster. Don't worry, whether you are a seasoned pro or brand new to fitness products, our DVD is going to walk you through everything! With that, I'd personally like to invite you to join The Blake Blaster revolution! Order your Blake Blaster today and receive everything you need in the box to get started. Maintaining proper form while exercising is absolutely critical to obtaining results and preventing injury. The Blake Blaster ensures proper form during your workout with its patented wedge design and strategic use of resistance bands. Designed by an airline pilot, the Blake Blaster was built for both home, gym and office use, as well as use while traveling. 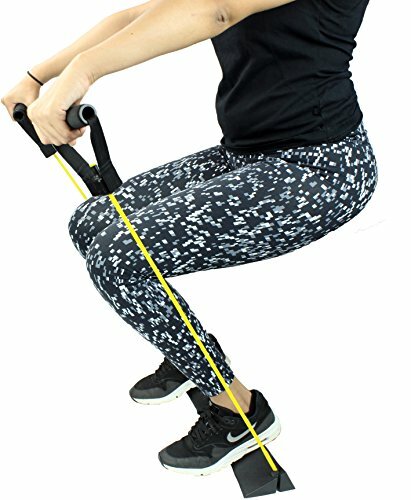 With your purchase, you will receive the patented Blake Blaster wedge, a set of resistance bands and a full workout DVD. Join The Blake Blaster revolution and redefine the gym-work out where and when it is most convenient for you. If you have any questions about this product by Blake Blaster, contact us by completing and submitting the form below. If you are looking for a specif part number, please include it with your message.